County Kerry, with Killarney and its lakes, contains the most celebrated, and consequently the most visited attractions in Ireland; the reputation of its landscape is amply justified but the town of Killarney is not of comparable interest. Among the mountain ranges are Carrantouhill (1038m), the highest peak in Ireland, Macgillycuddy’s Reeks, and the Slieve Mish mountains with Brandon (953m) and the highest peak. Waymarked walking routes, the Kerry Way (Killarney – Kenmare via Glenbeigh; 214m), explore the best of the region, the landscape, but away from the crowds. 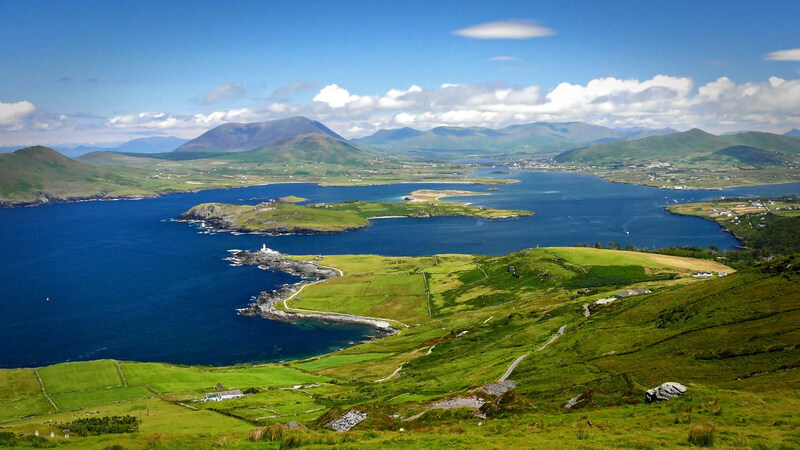 The peninsulas of Dingleand Iveragh – their rugged landscape, antiquities and attractive villages. The islands of the region, the Blaskets, Valentia and the Skelligs are of considerable interest. The Great Skellig is celebrated as the site of the most remarkable early Christian monastic site in the country, Staigue Fort, Ardfert and Gallarus are most important sites, and Derrynane is the family home of Daniel O’Connell, “The Liberator”. Killarney & The Ring of Kerry are real must see attractions on any Ireland tour.